The newest movie in the Swan Princess Collection is soon to be released and my girls got the opportunity to review it before it gets released. We love all the Swan Princess movies and this one did not disappoint either. 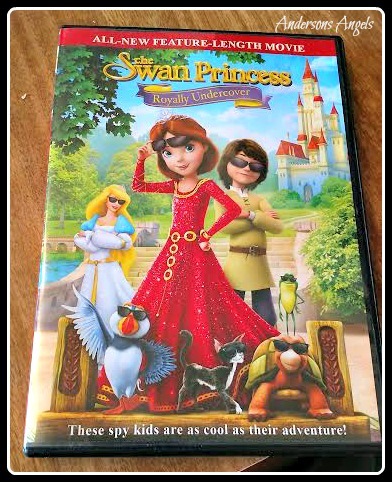 The newest movie in the collection is "Swan Princess: Royally Undercover ". Plot: "After the mysterious visitors arrive in the Kingdom, Princess Alise, Lucas and their friends go undercover on a secret spy adventure to see if they can be trusted. They will need all of their superior detective skillls as well as some super cool gadgets to solve the royal mystery and save the Kingdom. Directed by Richard Rich from a story by Richard Rich and Brian Nissen, and a screenplay by Brian Nissen, The Swan Princess: Royally Undercover was produced by Richard Rich, Seldon O. Young and Jared F. Brown, with Seldon O. Young serving as executive producer. The girls and I really enjoyed this movie and if you have a young one in your home I am sure they would enjoy it as well. In my opinion this movie is great for the whole family not just girls. It has a great story filled with mystery and excitement. You can purchase this wonderful DVD starting March 28th!! Be sure to pick up a copy for your family I am sure they will Love It! !